I’m not going to lie, I was really unsure about how Detroit Grooming Co ‘Corktown’ Beard Oil would smell, its Cedarwood, Vanilla and Tobacco and its the tobacco that had me concerned, I’m a non smoker and I really couldn’t understand why you would want a tobacco smell on your beard? I’m pleased to say that my concerns weren’t valid, ‘Corktown’ smells amazing, its weird because you definitely get that tobacco smell and yet as a non smoker I like it. I love the Vanilla in this oil and I think it’s that marriage of vanilla oil with the tobacco that makes it work! This oil is based on a blend of Sweet Almond, Vitamin E, Sunflower Seed, Safflower Seed, Rice Bran, Apricot Kernel, Avocado and Wheat Germ carrier oils. The Detroit Grooming oils will keep giving off that amazing scent all day long, they leave your beard feeling soft and with a slight hold to keep it looking good all day with a nice shine without being too greasy. Named after the oldest neighborhood in Detroit, we’ve been told that our Corktown Beard Oil scent is reminiscent of the old world. Perhaps of a simpler time, when a man never let a day go by without putting in hard work, and knew how to kick his feet up when he got home to relax with the smell of sweet tobacco in his pipe. 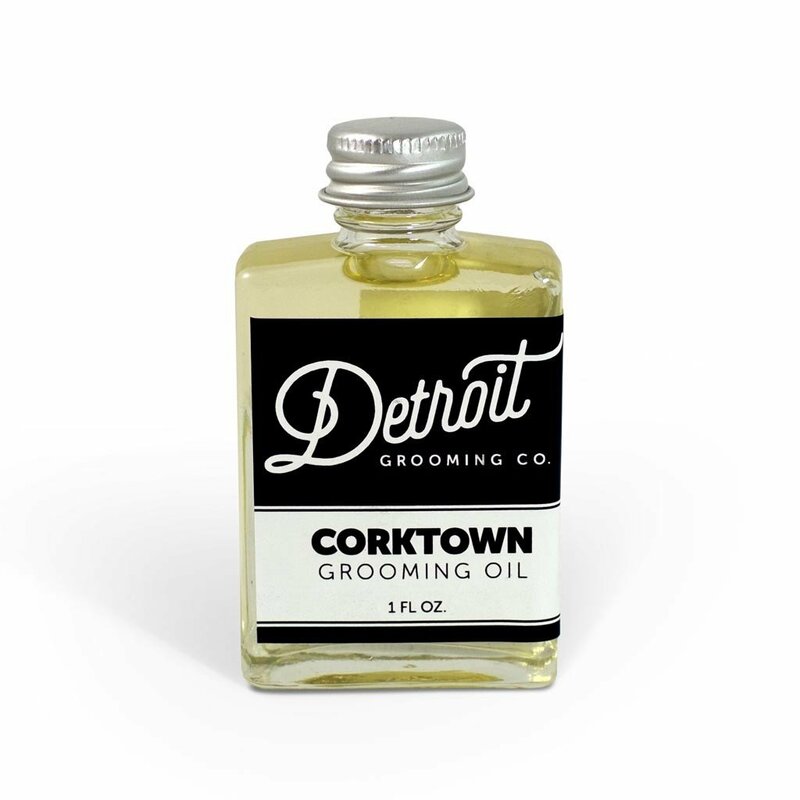 Corktown is an easy scent that is sweet and yet mild enough to let you know that you can relax all day as our pleasingly scented oil goes to work in your hard earned beard. Expertly blended, the cedarwood, vanilla, and tobacco, will draw you back in your chair with that rare kind of satisfaction. Our foundation of Sweet Almond Oil is loaded with many skin and hair benefits. Rich in vitamins A, B and E, Sweet Almond Oil helps in maintaining moisture levels of the skin and gets absorbed quickly without blocking pores like so many other oils. Whether you’re looking to improve your complexion, moisturize better, soothe skin irritation by relieving dryness, nourish your skin, or even cure the chapped lips hiding in your beard, this is exactly what you need. That’s just your skin! In the hair? Well, almond oil is rich in magnesium, gets rid of split ends, and leaves your beard shiny and soft. It is a reparative solution that can be used daily to saturate deeper than most oils and reverse damage. It contains a higher content of mono-saturated fatty acids than any other oil, making it the most intensely moisturizing oil available. It’s chock-full of antioxidants and proteins to repair your skin and hair! The tobacco smell is really nice, I’m a former smoker and while I no longer like the smell of smoke, I do love the smell of unlit tobacco, especially pipe tobacco. I don’t mind the smell of a good cigar, I wouldn’t smoke one though!